The Avery media range offers the perfect products for the labelling of all kind of data mediums. Whether in the office or at home, we have labels for data, photos or music. 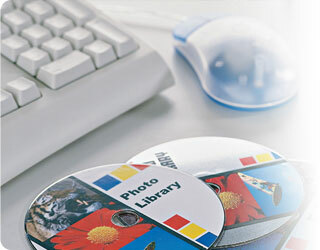 Designing, printing and applying professional looking CD/DVD labels is as easy as 1 2 3. Full face label design to cover the whole surface of your CD/DVD, making it printable to the inner hole allows for more creativity. Available for Laser and Inkjet printers to suit your needs. 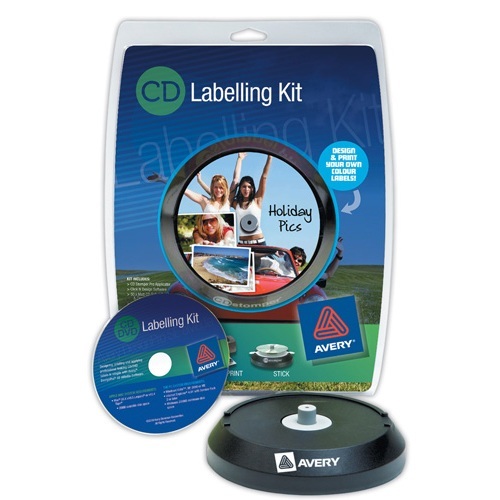 Avery® CD/DVD kit with everything required to design and print professional looking labels. The software is compatible with all Avery CD and DVD labels. Use the software to create high-quality, custom-made disc labels to suit your needs perfectly. The kit includes software, pre-designed templates, 50 inkjet CD labels and 10 inkjet DVD labels and label applicator. Compatible with laser and inkjet printers, although this pack contains only inkjet compatible labels. Avery Matt White Full Face CD Labels for B&W Laser printers. A4 Size - Matt White - Permanent adhesive. Avery Glossy White Full Face CD Labels for B&W and Colour Laser printers. A4 Size - Glossy White - Permanent adhesive. Avery Matt White Full Face CD Labels for Inkjet printers. 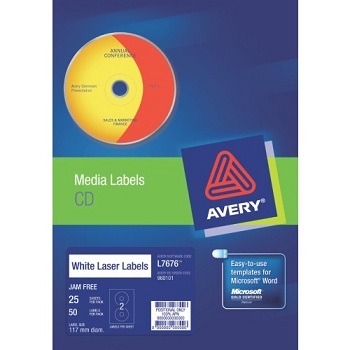 Avery Matt White Full Face DVD Labels for Laser printers. Avery Matt White Full Face DVD Labels for Inkjet printers. 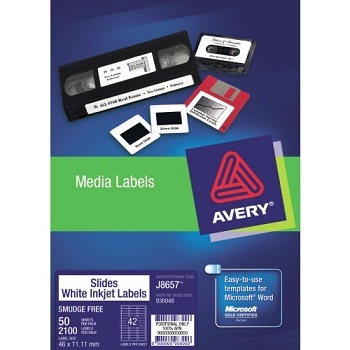 Avery White Media Laser Labels for Audio Cassette Tapes. Avery White Media Laser Labels for 35mm Slides. Avery White Media Inkjet Labels for 35mm Slides. Avery White Media Laser Labels for Mini Data Cartridges. 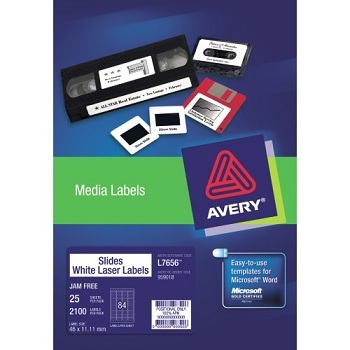 Avery White Media Laser Labels for 3.5" Diskettes Face Only. Avery White Media Inkjet Labels for 3.5" Diskettes Face Only. Avery White Media Laser Labels for Standard Data Cartridges. 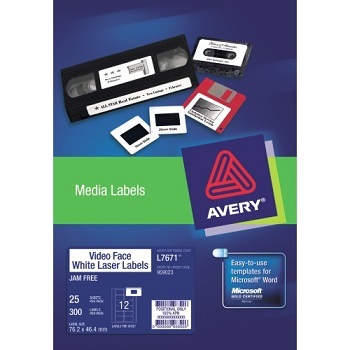 Avery White Media Laser Labels for Video Tape Face. Avery White Media Laser Labels for Video Tape Spine. Avery White Media Inkjet Labels for Video Tape Spine.